In the 108th meeting with rival Bethany, Kansas Wesleyan made sure to make it special. Junior tailback Demarco Prewitt ran for over 200 yards and six scores, Kansas Wesleyan gave up just 70 yards in the second half, and the No. 12 Coyotes rolled by the Swedes, 70-24, Saturday night at Anderson Stadium. KWU defeated BC for the fourth consecutive time, accomplishing such feat for first time since 1954-57. The 70 points were the most by either program in the First Bank Kansas Smoky Hill Showdown. Much like 2017, both offenses had no trouble getting going. Bethany relied on the arm of senior quarterback Isaiah Salazar, who skied a pass to junior Jafar Thomas for a 32-yard score. Former Salina South Cougar Fernando Avila-Castro added a 31-yard field goal. But, Kansas Wesleyan scored on all of its drives in the opening stanza. Prewitt had TD runs of 1 and 10 yards, and junior Johnny Feauto closed the quarter with a 41-yard strike to sophomore Charlie Simmons, giving the Coyotes a 21-10 edge. Bethany answered with a 31-yard lob for a score as Salazar found Thomas. That wasn’t enough for the duo, who hooked up on a seven-yarder, putting KWU in a hole for the first time in 2018, leading 24-21 with 7:06 to go in the first half. 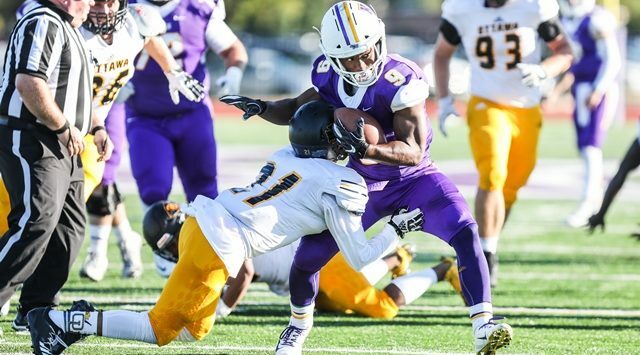 Kansas Wesleyan responded with 49 unanswered points. Feauto launched a missile to junior Trenton Poe-Evans for a 43-yard TD connection, followed by a Prewitt six-yard push to bring the score to 35-24 at the break. The Coyotes turned to short touchdowns the rest of the way, getting scoring runs of eight, one and nine yards from Prewitt and a one-yard dive by Feauto. The BE Wealth Play of the Game wasn’t that, though. Instead, Feauto “the magician” found Poe-Evans on a 4th and 15 from the Bethany 33, resulting in a touchdown. Prewitt ended up as the Salina Ortho Player of the Game, carrying the ball 37 times for 264 yards and six touchdowns, while also picked up 61 receiving yards. In the last two games, Prewitt has rushed for 484 yards and 10 scores. KWU also ran for 300-plus yards for the third consecutive game, hitting that total for first time since 2008. Feauto was 19-of-27 passing for 327 yards and three touchdowns. Poe-Evans finished with five grabs for 108 yards and a pair of scores. Simmons had five catches for 93 and a TD. For the second straight game, KWU accumulated over 600 yards of total offense, finishing with 649 on 85 plays. Bethany ended up with 329 yards, but only had 70 total in the second half. Salazar was 20-of-42 for 279 yards and three scores. Thomas pulled in six catches for 98 yards and three scores, but had just one reception in the second half. Bethany dropped to 1-5, 1-4 in the KCAC. The Swedes head to Wichita next week to face Friends (0-6, 0-5) with pregame at 2:30 pm on 95.5 The Rock. Kansas Wesleyan (5-0, 4-0) is lone team left standing with a perfect record in the KCAC. The Coyotes return home to face Saint Mary (1-3, 1-3) with pregame at 4:30 pm on FM 104.9.